I’ve spent a good part of the last few months running and hiking in the woods trying to wear out this guy. But, as everyone knows, that runs counter to a well-established law of physics which states that No Amount of Distance Travelled Will Exhaust a Ten-Month Old Labrador. So pretty much it’s just tired me out (which isn’t bad) and also allowed me to explore new trails and woods that are near home. The other day I was running on a trail I had never been on in the summer - having only skied it years before. And it was on the way down that I saw this, just to the right of the trail. It took my breath away - as they always do. Evidence of an old house, an old farm that used to stand right here. The foundation is all that is left. And I can’t help but think of all the hours worked, and the births, deaths, music, tears, and life that occurred here years ago. And what happened to them? Did they want to leave or did they have to? The ghosts are there. 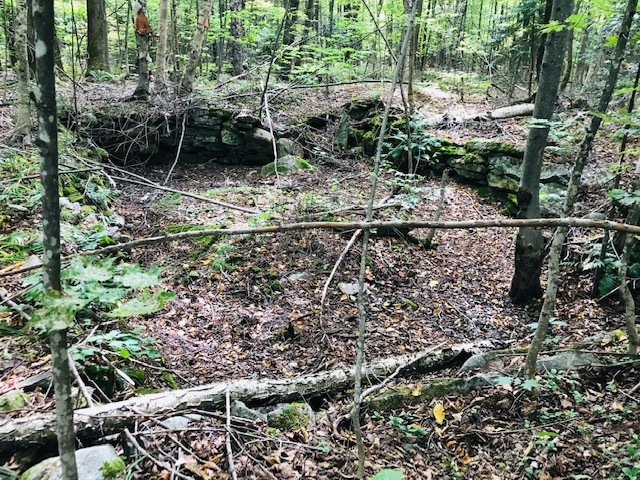 I felt as though I was intruding, as a spent 15 minutes looking around at the old barn foundation, the well, the plowed forest floor, and the stone walls. There are a lot of seeds around right now. I’m shelling dry beans from the garden, the kids come running in with “stick tights” stuck tight over their shirts and shoes, turkeys are running around eating up the acorns, and milkweed seeds are blowing from alongside the pond. Seeds do get around. They’re supposed to, that’s their job - to get as far away from the parent plant as they can and set up shop to grow and reproduce. Seed dispersal is a plant’s one big shot at horizontal movement. These maple samaras (a.k.a. helicopter seeds) are in abundance now. They are the twins of the seed world, clustered together on the ends of branches, waiting for the right time to take flight. Once airborne they twirl either clockwise or counterclockwise with precision, as the angled “wing” weighted on the top side and papery on the bottom side give a lesson in perfect physics. 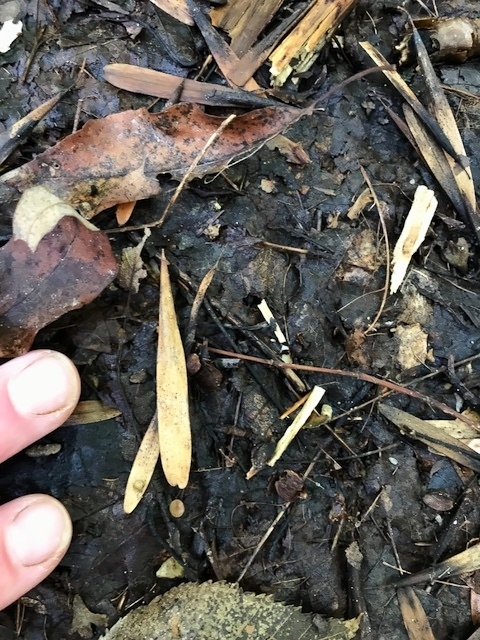 These ash seeds are also samaras, but in a different style. They have a single straight wing and the seed is much smaller and less heavy. The seeds all hope to land in a spot just right for germination. Most don’t. And then even those seeds that do germinate never make it to maturity. But trees play the long game - sending thousands of seeds out year after year at great energy expenditure with pretty incredible success. The Vermont woods are littered with evidence of past human disturbance. 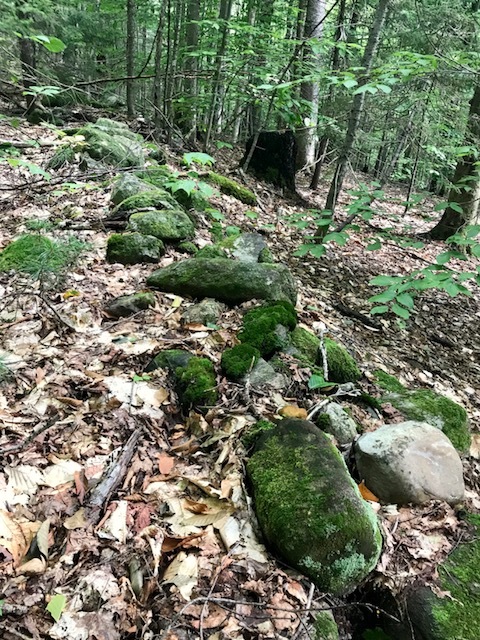 Many of the stone walls that criss-cross the woods and lines our roads were made in the late 1700s/early 1800s as European settlers deforested and plowed the land for crops. Every time their plow came across a rock in the ground they would stop, pick it up, and carry it to the side of their field - an arduous task as the glaciers dumped horrible amounts of rock during their retreat 10,000 years ago. Stone walls are often nothing more than stone dumps. While some of them do delineate old (and current) property lines, many of them just separate different fields. In this photo, the forest floor on the left side of the wall comes up higher - almost to the top of the wall - whereas the right side drops down. This is called a plow terrace, and is further evidence of plowing, as repeated turns of the plow caused soil to be pushed down hill until it hung up against the stones. On either side of the wall, you can also see that plowing over 150 years ago has smoothed out the natural irregularities of the forest floor making the ground fairly smooth and even, a trait that doesn’t exist on unplowed land. Much of this cultivated land was turned over to pasture land when sheep were introduced to Vermont in the mid-1800s, and then much of it returned to forest between 1900-1950. Vermont has young forests - but aggressive as hell as it is a fight to keep land open. Trees are an unstoppable force. During sugaring season, I am forecast obsessed. I’m not a true weather geek because, while it’s super cool, I have no idea how to make weather-forecast models based on existing data. So I just frantically check two different weather forecasts probably to the tune of six times a day. It’s strangely necessary because a 2-3 degree difference in either daytime or nighttime temperatures can determine whether the sap will run through the night, when we turn on and off the RO during the day, if the sap tank could overflow, when I might actually go to bed, when we start boiling, etc. Temperature becomes the governing factor of my entire day for weeks on end. I find I interact with people differently too. I’m horrified that people don’t know that we might get 1” of freezing rain on Thursday or that the nighttime temps will be above freezing for three straight nights. HOW COULD YOU NOT KNOW THIS! Can you believe that it’s not going to get above freezing for the entire first week of April?!? Unthinkable! What is going on? And wait till you see what’s going to happen on Tuesday! But that’s farming, and we are farmers because of this one fact: We are temperature bound. We cannot control the temperatures and the temperatures control when the sap runs. What we can control is how much sap we get once it starts running and how quickly we can process it. But we can’t make it run. But then sugaring ends and spring eventually does come, and I find I might go an entire day *gasp* without checking the weather. Or I might look at the week’s weather on Monday and then be duly outraged when the sunny Friday predicted on Monday is actually rainy, and I happily get caught in rainstorms and wear too many layers. Number of days boiling in April: 7 (we generally boil every day in April until the season ends). We had two week-long freeze ups in April. But, as our in-house first-graders say, 'You get what you get and you don't get upset.' We have no control when the season starts and finishes. All we can do is be ready and try to keep it going as long as possible. It seems the season is extending longer and longer. Back in the day, old timers wouldn't even start tapping until Town Meeting Day (the first Tuesday in March). Now people are tapping in January and having to keep the vacuum running in an attempt to prevent the tap holes from sealing. After 6' of snow, a 24-day freeze up, and a lot of powder days on the hill, the sap finally ran March 25 and we have been going straight out since then. We're hoping to push out through into next week although the weather isn't too favorable. We're constantly scanning the long-term weather forecast for when night temperatures will be consistently above freezing, as that signals the end of the sugaring season. Until then, I am hoping to make the last 1/3 of our crop. The sap stopped running March 2 when the first of the two nor'easters blew through. The second one, which hit March 8, dumped 30" of snow on Bobo's Mountain and through the mountains of southern Vermont. Between powder runs, we finished off the syrup in the pans, cleaned them, and are now waiting for the next sap run which really may not come for a while. Another storm and up to 12 more inches of snow is coming tomorrow. The sugarbush is buried, and I am hoping optimistically that the snow will "settle" before uncovering lines and fixing anything that's popped or broken in the last two weeks. The 2018 sugaring season has exploded onto the scene like Chloe Kim and Jessie Diggins in Pyeong Chang. We boiled seven of the last nine days in February. And the sap keeps running. And we keep filling barrels. What this means for how the rest of the season plays out is anyone's guess. Improvements to the sugar house this year include a separate, insulated kitchen area with a coffee maker and stove; actual chairs; and a brand new barrel mover. It's the little things. Magical Mystery #1: Our filter press and reverse osmosis filters have been working hard to keep up with what appeared to be dirty/mineral sap. We thought it was just the first sap run and it would clear. But it didn't. Then we thought there was something amiss with our equipment, so we checked around. It turns out many sugar makers in our area (and maybe beyond) are experiencing this, and that the word on the street/text threads is that there is a high manganese content in the sap that is choking all our filters. If anyone can explain this and why it's cyclical -we haven't experienced this before- give us a shout. I haven't had time to research it: I've been too busy making coffee. After 5' of snow, a 24-day freeze up, and a lot of powder days on the hill, the sap finally ran March 25 and we have been going straight out since then. We're hoping to push out through into next week although the weather isn't too favorable. We're constantly scanning the long-term weather forecast for when night temperatures will be consistently above freezing, as that signals the end of the sugaring season. Until then, I am hoping to make the last 1/3 of our crop.